Charles Eames once said that in the "world of toys he saw an ideal attitude for approaching the problems of design, because the world of the child lacks self-consciousness and embarassment." When I came across this statement in The Work of Charles and Ray Eames: A Legacy of Invention (p. 139) it really jumped out at me. I have been doing a lot of play-testing with kids and adults and I have noticed how much more quickly kids learn. Children just proceed and experiment, they figure things out as they go along, they don't worry about rules, judgement or success. The "world of the child" comment, led me to notice an underlying connection between the Eameses architectural design and their toy design (see this link for lots of photos of the interior and exterior of the Eames House). Both the Eames House and their toy the House of Cards have simple repetitive structural systems. 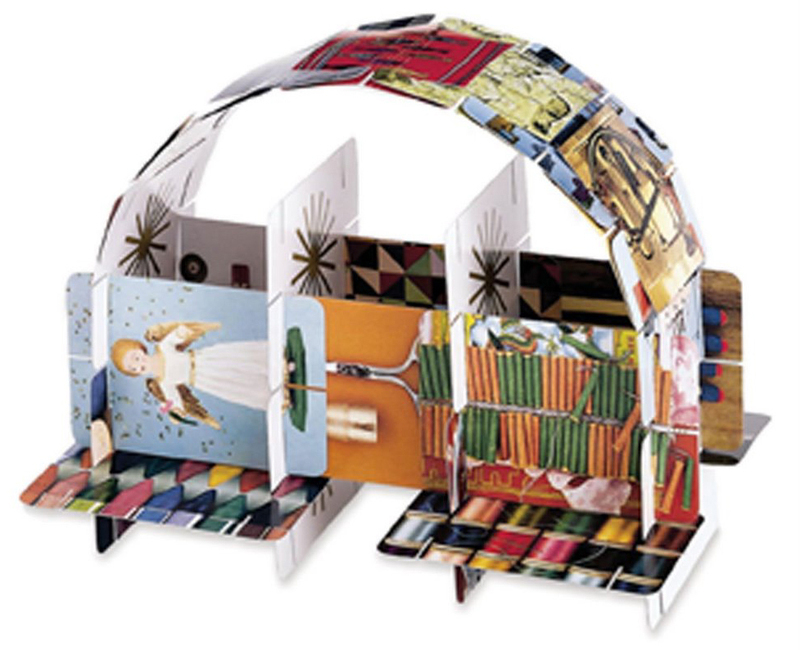 The structural systems work, but it is the play of color and the collections/images of diverse things (in the house and on the cards) that brings them richness and meaning. Playing with the cards and living in the house are similar activities -- both involve a continual rearrangement of things, a richness of ideas that can come together in ways which inspire new unexpected and creative thoughts. Look closely at the photo here. Who ever thought of "angels and firecrackers in an archway"? These things don't go together. Such a combination is against the rules, but there are no rules in "the world of the child." For more information on Charles and Ray Eames, see this website related to the Legacy of Invention exhibition organized by the Library of Congress and the Vitra Design Museum. Q-BA-MAZE is a marble run and construction toy which inspires creative play. Designed for children and adults by Andrew Comfort.